Boat Description The quick-planing Quicksilver 355SL and 410SL models are for more sheltered waters. The high freeboard Quicksilver 450SF, 450DLX and 500SF are designed to take up to a 30HP and 40HP outboard respectively. They come complete with fishing rod holders (except 450DLX) and a fuel tank platform. Quicksilver 450 DLXThe 450DLX combines an easy to walk on floor with the traditional performance of a V-bottom hull. Spray chines throw water away from the boat to give you a dry ride, even in choppy water. The split centre seat permits easier movement in the boat. 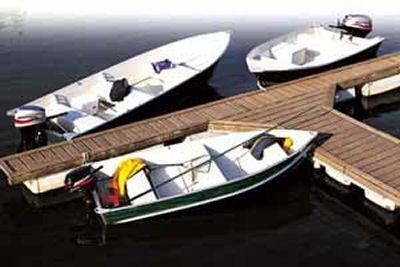 Fishermen and boaters alike will really appreciate the two closed storage compartments for gear and equipment. The port compartment is watertight and can be used as a live well. For extra comfort, the seats are topped with a weather resistant vinyl covered pad.